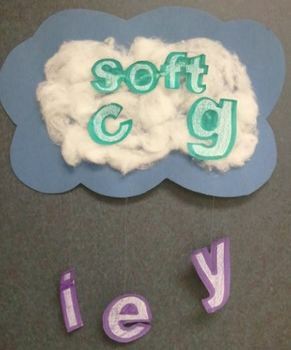 This product is a pattern to create a product that will help your students learn & remember the rule for the soft sounds of c and g. The soft sounds c and g sit n a SOFT cloud of cotton balls. I attached the letters I, e, and y with fishing string AFTER the c and g (hanging below). When c or g have an i, e or y after it, they will make their soft sound.